Jurassic World: Fallen Kingdom is an upcoming American science fiction adventure film directed by J. A. Bayona. The film is a sequel to Jurassic World (2015) and is the fifth installment of the Jurassic Park film series, as well as the second installment of a planned Jurassic World trilogy. The film features Derek Connolly and Jurassic World director Colin Trevorrow both returning as writers, with Trevorrow and original Jurassic Park director Steven Spielberg acting as executive producers. The film is set on the fictional island of Isla Nublar, located off Central America's Pacific Coast. Filming took place from February to July 2017 in the United Kingdom and Hawaii. Chris Pratt, Bryce Dallas Howard, B. D. Wong, and Jeff Goldblum will reprise their roles from previous films in the series, with Ted Levine, Rafe Spall, Toby Jones, Justice Smith, James Cromwell, and Geraldine Chaplin joining the cast. Universal Pictures has scheduled the film to be released in the United States on June 22, 2018. After the demise of the Jurassic World theme park on Isla Nublar off Central America's pacific coast, the dinosaurs roam freely on the island for four years until an impending volcanic eruption threatens to destroy the island and the dinosaurs. Claire Dearing (Bryce Dallas Howard), the former park manager, has now founded the Dinosaur Protection Group, an organization dedicated to saving the dinosaurs. Claire teams up with Benjamin Lockwood (James Cromwell), the former partner of John Hammond, to launch a dinosaur rescue mission and bring the creatures to safety in a sanctuary that Lockwood has created in America. 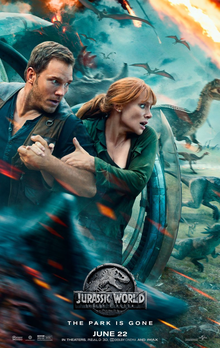 Claire also convinces her boyfriend Owen Grady (Chris Pratt), a former dinosaur trainer who worked at the park, to join her mission so he can locate Blue, the last remaining of the four Velociraptor that he trained. After Isla Nublar is destroyed by the volcano, the dinosaurs are brought to Lockwood's large estate, in America. At the estate, Owen and Claire realize that the dinosaurs are being auctioned rather than saved. An extremely dangerous hybrid dinosaur known as the Indoraptor escapes and terrorizes people at the estate.